c.1920 German Half-Second Wall Regulator with Riefler Pendulum. c.1900 Rare Gilt-Bronze and Rosewood Gravity Ball Industrial Clock. c.1877 German Carved Walnut Long-Running Conical Wall Regulator Clock. c.1910 ‘Nodder’ in form of Young Magician. Rare Early 19th Century Series II Robert-Houdin Mystery Clock. Early 19th Century Grande-Sonnerie Carriage Clock by Lepaute. Early 19th Century French ‘Au Bon Savage’ Clock, ‘Paul and Virginia’. c.1840 French Animated Conjuror Clock. A Late Victorian Nautical Striking Bulkhead Clock Incorporating the ‘Dog Watches’. c.1875 French Gilt-Bronze and White Marble Mantle Clock with Perpetual Calendar. c.1850 Massive Japanese Striking Stick Clock. c.1895 French Globe Mantle Clock. c.1870 Rare Animated Bird Carriage Clock. Late 18th century English and Japanese Fusee Watch. 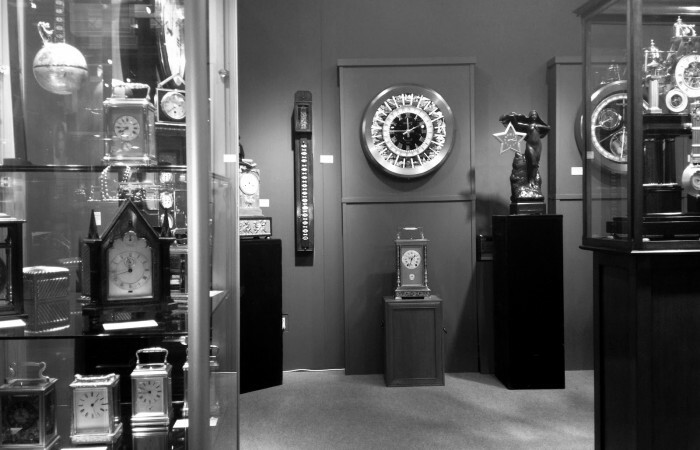 c.1890 French Animated Helmsman Clock. Rare c.1845 Swiss Gilt-Silver Fusee Singing Bird Box. c.1900 French Bow Sided Carriage Clock with Limoges Dial. Mid 19th Century French Capucine Clock with Horizontal Balance Platform. c.1895 French Gorge Cased Grand-Sonnerie Carriage Clock. c.1875 French Gilt-Bronze Lyre Clock with Swinging Brilliants Bezel. c.1885 French Gilt-Bronze Double Dial Calendar Clock with Elaborately Engraved Mask. c.1895 Large French Gilt-Bronze and Feldspar Annular Clock. c.1840 Striking Carriage Clock in Rosewood Case with Cast Gilt-Bronze Handle. c.1909 Silver Quarter-Striking Carriage Clock with Matching Silver Box. c.1895 French Gilt-Bronze and Crystal Inverted Portico Clock. c.1885 French Gilt Bronze and Marble Swinging Lyre Clock. c.1890 French Engraved Gilt-Bronze Miniature Oval Carriage Clock with Enamel Panels. c.1840 Rare Japanese Dual Time Bracket Clock. c.1840 French Gilt-Bronze Time and Strike Carriage Clock. c.1840 French Engraved Gilt-Bronze Carriage Clock with Alarm. c.1875 French Gilt-Bronze Carriage Clock with Porcelain Panels. c. 1820 Large Ormolu Urn Clock. c.1800 French Ormolu Mantle Clock Surmounted by Cupid. c.1840 French Ormolu and Porcelain Portico Clock. c.1885 French Gilt-Bronze Carriage Clock with Limoge Panels. c. 1825 Small Viennese 30-Day Lanterdluhr Wall Clock. c.1895 Rare Miniature French Silver Champlevee Paneled Gilt-Bronze Carriage Clock. c.1900 Swiss Silver Enameled Annular Mystery Clock. c.1929 Extremely Rare Cartier Ship’s Striking Mantle Clock. c.1885 French Giant Engraved Gilt-Bronze Paneled Carriage Clock On Original Base. c.1920 Extremely Rare Swiss Lapis, Quartz, Enamel, Silver and Ivory Annular Clock. c.1800 Rare French Blackamoor Clock, America. c.1860 French Two Day Mahogany Chronometer. c.1775 French Ormolu, Patinated, Silver, Bisque and Marble Annular Dial Clock. c.1890 Extremely Rare French Animated Printing Press Industrial Clock. c.1810 An Exceptionally Rare French Ormolu Animated Carousel Clock. c.1832 Extremely Rare Patinated and Ormolu Automated Conjuror Clock. c.1895 French Gilt Bronze Four Glass Mantle Clock with Terrestrial Globe. c.1840 Extremely Rare English Rolling Ball Clock in Glazed Gilded Case. c.1825 Large French Three-Month Skeleton Clock with Moon Dial and Simple Calendar. c.1923 English Eight-Day Chronometer Mantel Clock. c.1810 Miniature English Inlaid Ebony Time and Strike Bracket Clock. c.1836 Rare and Early French Animated Conjuror Clock, J.F. Houdin, Paris. An Extremely Rare Swiss Early 20th Century Enamel and Silver Annular Dial Mystery Clock. c.1880 French Engraved Gilt-Bronze Oval Carriage Clock with Grand-Sonnerie Striking, Simple Calendar and Alarm. c.1762 Rare French Ormolu Quarter-Repeating ‘Pendule d’Officier’. c.1898 French World Time Orrey Clock. c.1900 French Enameled Silver Rhombus Shaped Compendium. c.1885 French Gilt and Silvered Bronze Carriage Clock with Enameled Panels. c.1810 Large French Ormolu and Antico Verde Marble Figural Mantle Clock. c.1873 French Gilt and Silvered Bronze Mystery Desk Inkwell Compendium. c.1885 French Gilt, Coppered, Silvered and Patinated Bronze and Marble Animated Torpedo Boat Clock. An Extremely Rare Early 20th Century Enamel, Silver, Ivory and Marble Annular Dial Mystery Clock. c.1810 Rare French Ormolu and Patinated Blackamoor Mantle Clock. c.1800 Japanese Temple Bell Clock Suspended in a Lacquered Mirrored Case. c.1925 Swiss Enameled, Rose Quartz, Gold and Silver Minute Repeating Travel Clock. c.1885 French Gilt-Bronze and Tortoise Hanging Lantern Compendium Clock.